William Gilkerson was born the 25th of July, 1936, in Chicago, Ill. to Ruth Henry (or perhaps Henri), a Scottish immigrant via Canada, and immediately adopted by the Gilkerson family of Wisconsin as intended heir to the family shoe business. In Gilkerson’s words, “the unlikelihood of that became ever more apparent over time.” His upbringing ranged between shoe towns in Wisconsin, Missouri, and Tennessee, with the Clayton, Mo. school system providing most of his primary and secondary education. The latter was several times interrupted by “various side adventures, with most of my 16th year on my own in Paris, allegedly studying art at the Academie Julian, living on the pittance my adoptive mother could send me.” An earlier adventure (at 14) included voyages between Ecuador and New Orleans as mess boy aboard a Norwegian freighter. Later at 17 a stint in the US Marine Corps earned him the Expert Rifleman decoration and a stripe. He was honorably discharged in 1954. Following that he made his livelihood as a nightclub sketch artist and freelance illustrator, attending Washington University in St. Louis for two years at its Bixby School of Fine Arts before going to Norway and buying a 44’ antique sailing sloop. 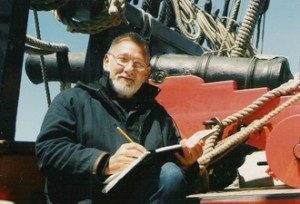 He learned seamanship while navigating it around much of Northern Europe, making and selling on-the-spot sketches, an activity that sparked his lifelong career as a marine artist, but with periodic interruptions into writing. After his return to the US (first as managing editor of the St. Louis Magazine, then as an editor and later special features writer for the San Francisco Chronicle) he lived aboard his next boat, a 38’ ketch in Sausalito. In 1970 he abandoned his newspaper career and joined The Golden Toad, a group of street musicians, as bagpiper and “mouth, begging quarters for the hat”. During this time, he fell in love with Kerstin Helleberg whose Swedish singing was “a burst of birdsong unto the world; she inspired me to return to a career, any career that would again provide a viable livelihood”. Bill and Kerstin married in 1978. Gilkerson’s work as a marine artist and noted scrimshander took him from California to Massachusetts. From then until now, he has interspersed his writing and painting, producing ten major institutional exhibitions (including the U.S. Naval Academy Museum, Annapolis, and the Peabody Museum of Salem’s first one-man show for a living artist), until his final relocation to Nova Scotia in 1987. There he dwells today, off Mahone Bay, sailing with Kerstin and family aboard their ancient cutter Elly, “as time allows”.